Fantasy Football is Hot for Bars & Restaurants! According to Forbes, 32 Million Americans play Fantasy Football and spend $11 billion playing. DIRECTV is helping you capture your part of that market by turning your bar or restaurant into NFL Fantasy Football Draft War Room! NFL Fantasy Football is hot and the demand for fantasy football information so prevalent that is has caused DIRECTV to create the new Fantasy Zone Channel for NFL Sunday Ticket Subscribers. Every fantasy football league has a draft to kick off its season. Friends get together and pick their teams. DIRECTV has put together amazing marketing kits to turn your bar or restaurant the Fantasy Football Draft War Room. 32 million people will be playing fantasy football this year. Use fantasy football draw in customers for fantasy drafts during preseason NFL Football & boost your revenue during this typically slow time. 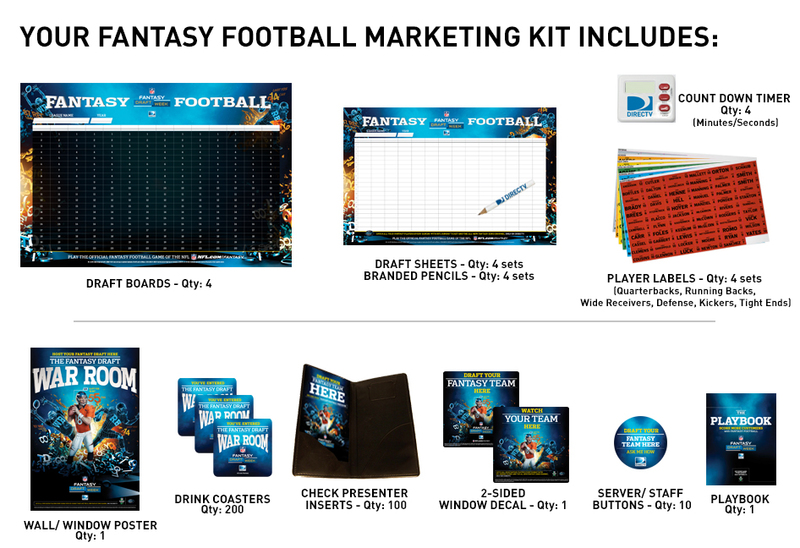 DIRECTV is now taking orders for the 2014 NFL Fantasy Football Draft Marketing Kits. The kits, which were a big hit last year, are available to all existing and new Bar and Restaurant DIRECTV subscribers. To order a kit, your bar or restaurant does not need to be NFL SUNDAY TICKET subscriber. 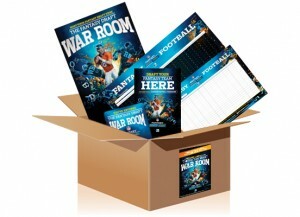 Everything you need to let all your customers know you are the NFL Fantasy Football Draft War Room! When you start marketing your bar as NFL Fantasy Football HQ, many leagues will want to come in and have their NFL fantasy football draft in your fun environment, so DIRECTV is making additional Fantasy League Packs available for you for just $10.00.